A better watch for daily use or teaching kids to tell time. 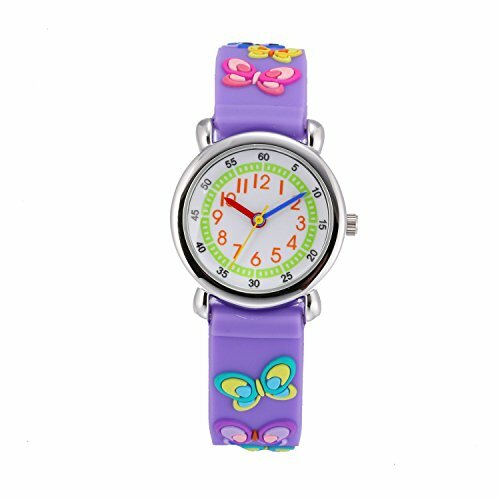 If you are looking for a "Time Teacher" watch for Toddlers, you have found the right watch. The watch is durable and stain resistant. • Healthy environmental protection material. • 3D pattern, exquisite workmanship. • Beautifully designed, each watch has their unique design concept. AFTER-SALES: Yours satisfation will be a great motivation for us. if you have any concern about our product and service,please do not hesitate to contact us via email. WATERPROOF: Daily waterproof function. The watch can be worn when children washing thier hands or playing with water . But we do not recommend wearing this watch when swimming and bathing, because it does not have the depth waterproof function. MATERIAL & UNIQUE DESIGN: High quality silicone strap, It uses healthy environmental protection material,comfortable and environmental friendly through international CE certification. With 3D cartoon design, every watch has their unique style. Each cartoon image is lively and interesting. GIFT PACKAGE：Ships in a Cute Watch Box - Makes a Great Birthday or Holiday Gift! If you have any questions about this product by Jewtme, contact us by completing and submitting the form below. If you are looking for a specif part number, please include it with your message.